Sears Handyman Services provides numerous electrical repair services to customers who prefer not to take on electrical repairs themselves. Sometimes, homes experience minor electrical problems that are troubling and time consuming, often requiring a handyman or home repair professional to correct. Instead of contracting an expensive electrician for a minor problem, you can call a Sears Handyman. 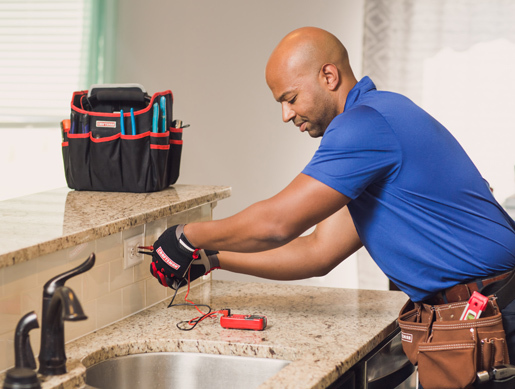 Our handyman technicians have a diverse knowledge of home repairs, and they can usually fix smaller electrical problems that many homeowners would rather not address on their own. For these and other common electrical repair needs, you can give Sears Handyman a call today. Our technician will handle that repair or replacement with the utmost care, ensuring that the work is done not only affordably but safely. Have a problem not covered by the list above? Just give us a call and describe your issue. We’ll talk through your repair needs and determine the best course of action, whether it’s service from one of our technicians or a recommendation that you enlist a licensed electrician.